Spain’s construction industry is expected to reach a value of US$234.9 billion in 2021 in real terms, measured at constant 2010 US dollar exchange rates, according to Timetric’s Construction Intelligence Center (CIC). According to the report, construction sector growth over the forecast period to 2021 will be supported by the government’s focus on the development of transport and commercial infrastructure across the country. The government’s efforts to balance supply and demand for housing will also drive demand for residential construction. Moreover, the growing foreign interest in the country’s construction industry is expected to drive foreign investment in construction projects over the forecast period. Under the National Rural Development Program for 2014–2020, the government plans to spend EUR435.0 million (US$482.9 million) to develop efficient irrigation systems and other agricultural infrastructure by 2020. Under the Aragon Rural Development Program for 2014–2020, the government plans to create jobs for rural people and improve their living conditions with an investment of EUR907.0 million (US$1.0 billion). In March 2017, the government announced its plan to spend EUR4.2 billion (US$4.8 billion) on the development of transport infrastructure, housing units and other infrastructure during 2017–2020. Under this, it plans to build a shuttle train line to link Barcelona’s El Prat Airport with the Sants railway station, with an investment of EUR285.0 million (US$322.3 million) by 2020. The government also plans to invest EUR200.0 million (US$226.2 million) on the modernization of Catalonia Airport by 2020. Moreover, it plans to modernize national highways between Lleida and Les Borges Blanques by 2020. 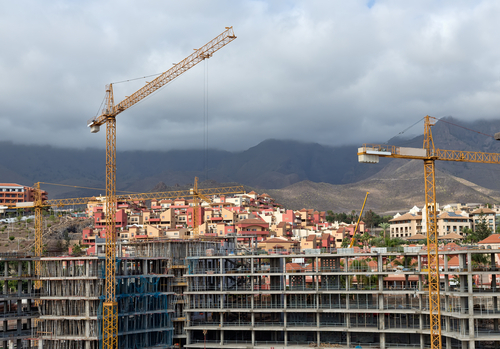 The Spanish construction industry’s forecast-period outlook is better than that of its review-period performance, with average annual growth in real terms set to improve from -3.6% during the review period to 2.8% over the forecast period. Residential construction was the largest market in the Spanish construction industry, accounting for a share of 36.9% of the industry’s total value in 2016. The market is expected to retain its position over the forecast period, constituting a 38.4% share of the industry’s total value in 2021. “The market will be supported by rising residential building permits, as well as the low housing loan interest rate. Urbanization, population growth, affordable housing projects and positive developments in regional economic conditions are expected to drive the market’s forecast-period growth,” comments Danny Richards, Lead Economist at Timetric's CIC. Infrastructure construction was the second-largest market in the industry during the review period, accounting for 29.9% of the industry’s total value in 2016. Market growth over the forecast period will be driven by government efforts to modernize the country’s transport infrastructure. Under the Plan Estratégico De Infraestructuras Y Transporte (PEIT), the strategic plan for infrastructure and transport program, the government plans to build 9,656km of new high speed railway lines by 2020. In addition, to improve regional connectivity, the government plans to invest EUR4.1 billion (US$4.6 billion) on railway infrastructure by 2020. This information is taken from the Timetric report: ‘Construction in Spain- Key Trends and Opportunities to 2021’.